San Francisco, USA -- As the violence in Tibet has continued, the Dalai Lama issued a stern statement that he could not align himself with insurrection in his home country. Buddhism rests on several pillars, one of which is nonviolence. Tibet quickly became a kind of Buddhist litmus test. How much pain and oppression can you stand and still exhibit loving kindness and compassion? I wonder if that's really fair. 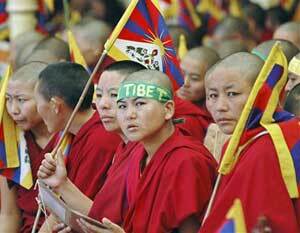 The Tibetans face a political crisis that should be met with political action. Whatever that action turns out to be, nobody should be seen as a good or bad Buddhist, anymore than defending your house from an intruder tests whether a Christian is living by the precepts of Jesus. What Buddha and Jesus undoubtedly had in common was a sense that another realm of existence transcends the material world. Buddhists are asked to consider how to reach that realm. There are no dictates (as far as my limited knowledge goes) to engage the world and solve its tortured dilemmas. Indeed, Buddha is famous for teaching that such solutions don't exist. It is futile to apply Buddhism to a political crisis -- or to the subprime mortgage debacle, for that matter -- because wrestling with the material world never leads to freedom, fulfillment, or peace.